Think you can’t afford a sparkler as magnificent as Meghan Markle’s engagement ring? Think again! Everyone loves a fairytale wedding. If Prince Harry’s recent engagement to American actress Meghan Markle is any indication, we’re in for a royal treat come spring 2018. The prince proposed to the Suits star with a custom designed and deeply personal three-stone engagement ring that has caught the world’s attention. Of course, now the question on everyone’s lips is how can they match the exquisite beauty of that engagement ring? Quite simple, actually. Read on to find out how you, too, can recreate Meghan Markle’s engagement ring. In coming up with a ring fit for a princess, Prince Harry knew he needed to pull out all the stops. He opted for a classic three-stone yellow gold ring with a difference; the center diamond which appears to be cushion cut is from Botswana, a country that he and Meghan visited earlier this year. Adding to the ring’s sentimental value, the two round cut side diamonds are from the personal collection of his mother, the late Princess Diana (a connection shared by Kate Middleton, who wore Diana’s actual engagement ring to her and Prince William’s wedding in 2011). This intricate floral handmade head assembly puts a unique twist on the classic three-stone diamond engagement ring. You can replicate Meghan Markle’s yellow gold ring even more by pairing this setting with a cushion cut diamond of your choice. For us non-royal folk, the Meghan Markle Engagement Ring look is surprisingly easy to achieve. Like Prince Harry, you can custom design an engagement ring inspired by Meghan Markle’s ring. 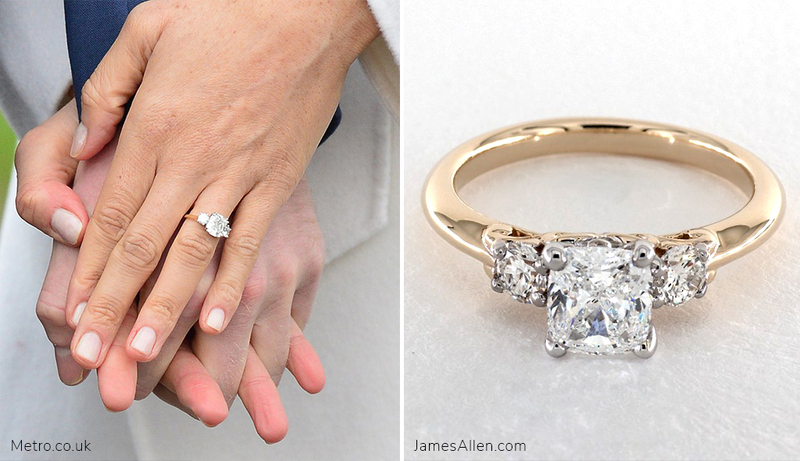 We’ve rounded up James Allen rings that bear the closest resemblance to Meghan’s three-stone stunner so you can sparkle like aristocracy for a fraction of the price! This classic three-stone round-shaped ring features a little extra shimmer with pavé set diamonds in the shank. This classic three-stone trellis setting features interwoven prongs sweeping upward to gracefully hold two half-moon shape diamond side stones. Inspired by the sapphires in Kate Middleton’s ring and the three-stone look of Meghan Markle’s engagement ring? This stunner has the best of both worlds, featuring two beautifully matched round-shaped blue sapphires as an accent to the exquisite center diamond of your choice. Loving Meghan Markle’s Engagement Ring? For more inspiration check out these three-stone engagement rings in 360° HD. Let us know what you think of Meghan Markle’s engagement ring in the comments below or over on Instagram, Facebook, Twitter, or Snapchat.